My experience of the Luna brothers’ work has to date been limited to Alex + Ada and a couple of issues of Girls. Eternal Empire, the latest collaboration between Jonathan Luna and Sarah Vaughn, is a very different beast to either, although it does share some thematic concerns, the challenges for women in oppressive societies being one of them. Set on a world which orbits three suns, this first issue primarily deals with the escape of an unnamed girl from a work camp and, along the way, gives us enough hints about the world in which the story takes place to make giving the next issue a look an attractive proposition. With comics being such a visual medium, whether readers enjoy a story or not depends a great deal on their reaction to the art. I mention this, because Luna’s art style is one about which I am a little ambivalent. It is clear, clean and crisp – almost to the point of crudeness. At times, his characters appear to display an almost mechanical stiffness. His storytelling, however, is exemplary. There are moments in this issue that possess an almost filmic quality. The fight between our protagonist and a pair of burly male guards is told in an absorbing, almost uncomfortably unhurried way that reinforces the sheer physical effort of her struggle to escape. The subsequent journey through the snow-swept night is also impressive storytelling (the page is divided up into a regular 4x5 grid and the story is moved as much by the slow lightening of colour as it is by the minimalist dialogue), as are the images of the girl supporting walking through fields of livestock and catching fish in a river. Luna’s art may not be to everyone’s taste, but it does involve the reader in the story. And the story is very interesting indeed. 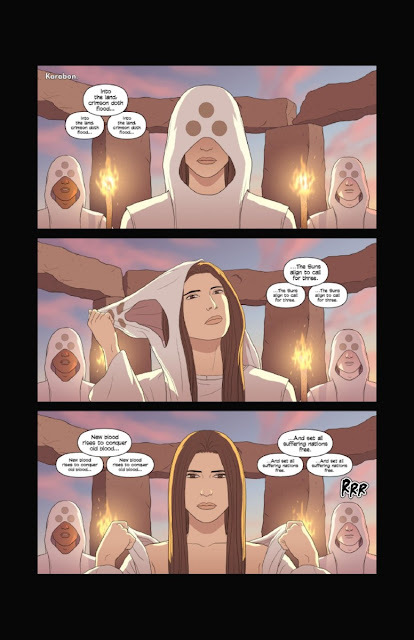 The issue opens with a ceremony in which a young woman divests herself of her robes and stands naked before a dragon-like creature and asks it to ‘join with her’ to create a new ‘one’, which seems to refer to ‘synnians’. The text is unclear on this point, but the ‘synnians’ appear to be a hybrid race who are currently rampaging through the continent and threatening Karabon, the nation where the ceremony is taking place. The woman, then, appears to be proposing that the dragon-creature help resist this invasion by creating a new hybrid to counter the old. This prologue is appropriately mysterious and just a little disturbing. The woman’s nakedness suggests the union will be a physical one; the dragon-creature’s chains suggest that it will not be entirely consensual. Throughout the scene, the three-sun motif is present – not just in the position of the suns in the sky (they are aligned in an inverted triangle pattern, equidistant from one another), but also in the cowls that the young woman and her fellow celebrants are wearing on the first page, as well as the fact that each line of the ceremony is spoken three times. All of which helps communicate the sense that this world has a culture and history that is at least in part influenced by its unusual relationship to its suns. We then jump forward 141 years to a work camp in which ‘haam’ are forced to work the soil, pulling up root vegetables from the frozen ground with their bare hands and living on subsistence rations as they do so. We see orderly rows of plants and wooden walls and guard posts that suggest the sort of institutionalised farming more associated with 20th century totalitarian regimes than your stereotypical fantasy setting. 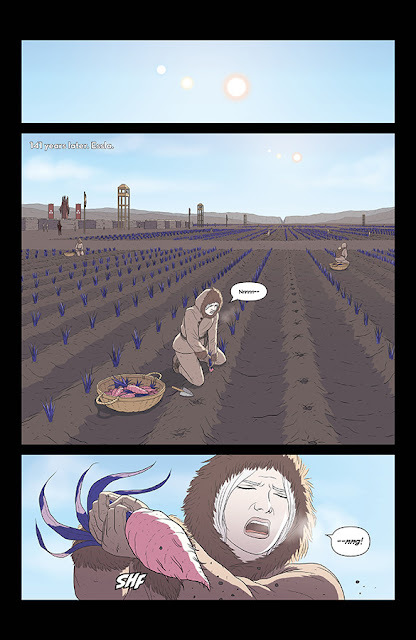 The work is hard as is made clear by Luna’s art and the fact that we see a worker being beaten for stealing food. 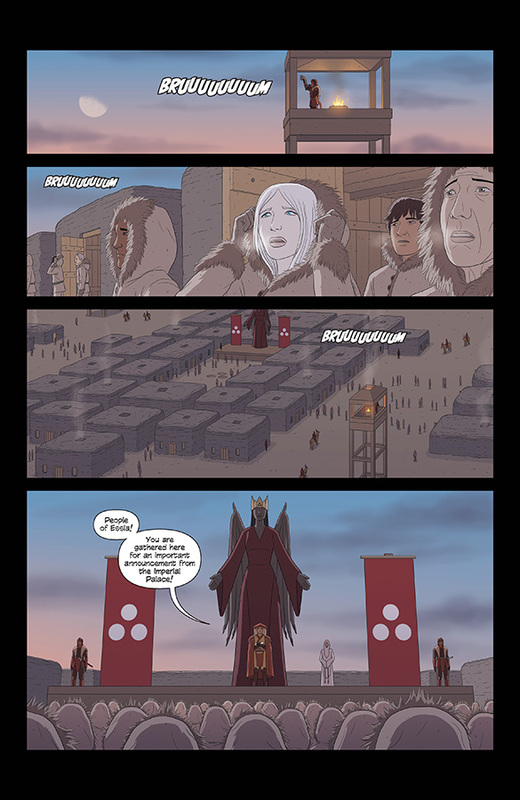 During this section, it is revealed that the work camp is run by the Eternal Empire which rose “to save the Eastern Three from the synnians of old”. This is a reference to the prologue. It would seem that the dream of liberation and survival has turned into something altogether more acquisitive and imperial. Hmmm. This announcement is made in the shadow of a large statue presumably meant to represent the Empress – a bronze-skinned woman with angelic wings and a neutral expression with arms by her sides palms outward in a gesture that is, perhaps, welcoming. We are told that the Empress is immortal and that her armies have just conquered Kadei and will march on Nifaal to unite the continent (or perhaps the world) under her rule. All of this is interesting to the reader, but not especially helpful to our protagonist who keeps on getting visionary flashes of warmth and light that impinge upon her drab, gruelling and frozen existence and offer her a tantalising hope of something better - or at least different. When the opportunity to escape comes, she does – although it is a close-run thing – and ends the issue with a surprise meeting with a mysterious bronze-skinned man who, it seems, can shoot flames from his hands. As introductory issues go, this is both intriguing and enjoyable. Much of the enjoyment comes from the undeniable sense that we are reading a story set in a world with a coherent history whose details have yet to be fully revealed to us. The main character is suffering, brave and resourceful – all of which are appealing, although she is presented to us with very little in the way of background or indication of any pre-existing family ties. She is, however, an immediately sympathetic character and an effective focus and vehicle for the issue’s main story. Her suffering is a key aspect of her appeal and Vaughn and Luna emphasise this through a number of encounters with authority. Her determination to escape through the blizzard is admirable, too. I said at the start of this review that, in terms of setting, this was a departure from Alex + Ada, but there are thematic similarities nonetheless. 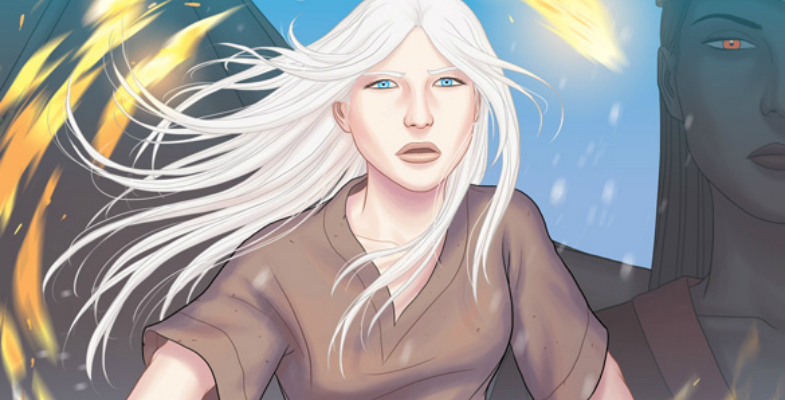 Like Ada, our protagonist here deals with imprisonment and escape. More than that, she is determined to explore the wider world and to take risks in order to do so. The differences between this story and Vaughn and Luna’s previous outing, however, are, if anything, more interesting. 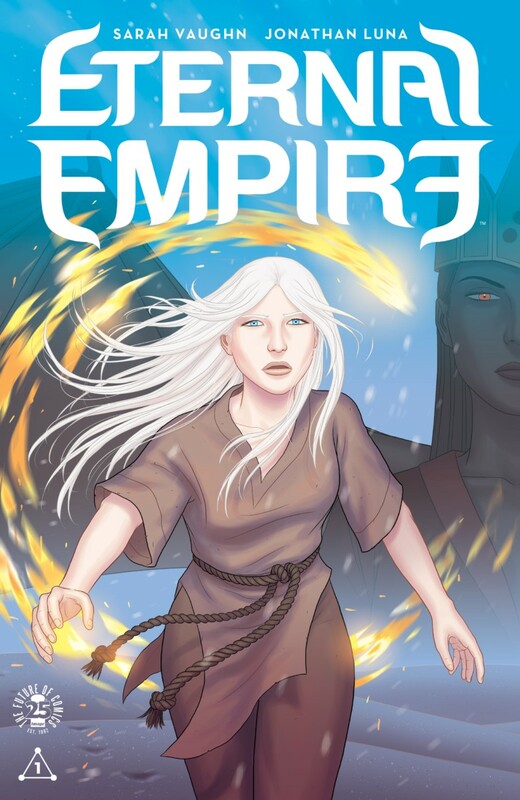 Eternal Empire’s setting – with its three suns and clearly defined geography (the issue has a map on the title page – I do love me a good map on a title page), its history and religion – are, at the moment, as intriguing and involving as the story of its protagonist. In introducing both, this issue is a clear success and one that, if dystopian fantasies are your bag, I heartily recommend.